I don’t know about you, but I am ready for warm weather! However, it appears winter is upon us for awhile. Dropping temperatures during the winter can play havoc with your septic system. We want you to be able to get through the winter with the least amount of septic system issues as possible. Septic systems are susceptible to damage from freezing temperatures simply due to the nature of the pipes being underground and somewhat exposed to the Kansas elements. When a septic system is installed, there are specific recommendations provided which dictate how deep the system and pipes should be to prevent freeze ups and ensure that the system works properly. 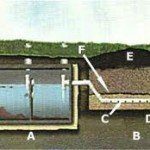 Any deviation from the recommended depth requirements from settling or heaving, can put your septic system at risk. Our company sees many freeze ups of underground systems, when the temperatures fall sharply below freezing, before there are any significant snowfalls for the season. The reason for this is simply that the snow acts as an insulating blanket for the pipes and system. If the temperatures fall low enough, without snow cover, the frost can get much deeper into the ground and reach the septic system pipes. Frozen pipes in your septic system will then cause a backup into your home or business because the disposed water and waste cannot get out into the septic tank itself and may end up in the lateral field causing unseen damage and as the frozen pipe section continues to freeze, it follows the pipe into the tank itself and begins to cause freezing in the tank as well. The first thing is to be sure your system is adequately covered with the appropriate amount of gravel and fill as recommended. Know where your septic system is located and in which direction the pipes run. Always be aware that damage can occur to the pipes if heavy equipment drives over them, freezing temperatures get to them, or you inadvertently uncover the lines during the winter season. This is important. In the winter, no matter what, if you have a good snow covering over your septic system, do NOT uncover, snow blow or plow the area near or around the system. Uncovering the system and the pipes leading in and out will allow the damaging temperatures to sink deeper into the ground and potentially freeze up your lines. If you are experiencing problems, give us a call immediately, to avoid a minor issue turning in to a major issue.